More of my reviews at Secrets of Lost Words.Rating: CNantucket Blue is a story of a girl who is going on summer vacation. 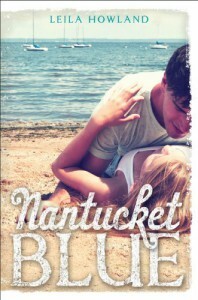 She was planning on going to Nantucket with her friend Jules until Jules' mom died. Jules then went cold on her and turned out to be a completely different person.Cricket as a character was great. She was easy to relate to and we read about her adventure of growing into her own person. I think she really found out who she was on her trip at Nantucket and that summer definitely changed her life. She found out her idea of love and actual love was different as she chose between her dream guy (Jay) and her new kinda-boyfriend (Zack). I thoroughly enjoyed reading about Cricket and all her life-changing decisions.But I found the book was a bit boring at times and didn't completely keep my interest. Jules also pissed me off. She was supposed to be mean and she was but I don't get how a person can turn around so completely. Isn't it when a loved one dies that you need your family and friends to lean on? Jules explained why she was being so mean in the end but it seemed like such a flimsy explanation. I also didn't find much of a big point in this story. I've read lots of good reviews that said they felt this book talked about the meaning of family and love, etc. But, I didn't. I just.. didn't, okay?Nantucket Blue was a bit of a disappointment as I've been anticipating this for a long time. It's a great contemporary to pass your time with and a great summer read.